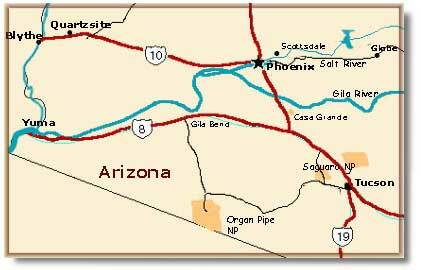 Yuma is located in the Sonoran Desert of southwestern Arizona along Interstate 8 and the eastern banks of the Colorado River. Yuma is one of the fastest growing metro areas in the US. Both its climate and location along the river make it a popular tourist haven in both winter and summer, especially for snowbirds and water enthusiasts. A military presence at the Marine Corps Air Station and the nearby Yuma Proving Ground, together with an influx of winter visitors every year, is responsible for continued population growth in both the city and the county. Yuma is Arizona's warmest winter city and the sunniest year round place in the US, with an annual average of 4,133 hours of sunshine. Yuma has a classic low desert climate with extremely low relative humidity and very high summer temperatures. Stores, shops, restaurants theaters and homes are air-conditioned year round. Yuma's recorded history began in 1540 when Spanish explorer Hernando de Alarcon, became the first European to see the region of the present town site. In 1701, Father Eusebio Francisco Kino was the first to recognize the Yuma Crossing as a gateway to California. A century later, Father Francisco Garces used the Yuma Crossing in his quest for a land route to California, leading Juan Bautista de Anza and his pioneering expedition across in 1774, on their way to the first successful land route to the California coast. Garces founded 2 missions at the crossing in 1779, but they were destroyed and Garces was killed during the last major Indian uprising a few years later. Fifty years later, it was rediscovered by Kit Carson and finally became a permanent colony in the 1850s, when Yuma became the major river crossing for the California gold seekers. From 1540 to 1854, Yuma was under the flags of Spain and Mexico, but in 1854 became a territorial possession of the United States through the Gadsden Purchase. In its early years, Yuma was identified by several names. From 1854 until 1858, Yuma was known as Colorado City; from 1858 until 1873, it was named Arizona City. Yuma received its present name by the Territorial Legislature in 1873. After the construction of Fort Yuma on the western bank of the Colorado River, in 1850, a town soon sprang up across the river which was the home of families whose occupations were tied to the army post. After the closing of the fort in 1883, the town continued to grow because of the establishment of the Arizona Territorial Prison in its midst and mining in the nearby mountains. The prison was moved to Florence, and the mining boom ended, but Yuma continued to flourish when dams were constructed on the Colorado River to store water for agricultural use. The County and City were named for the original inhabitants, the Yumas. The Yumas were a combination of Indian tribes of the lower Colorado Region, which consisted of the Quechans, Cocopahs,and the Mohaves. These tribes were related by being members of the same linguistic group. An abundance of recreational facilities include golf, tennis, fishing, hunting, boating, swimming, and rock hounding to mention a few. Yuma's Calendar of Events is packed with things to do and see while providing a diversity of history and culture. Two state historical parks, Yuma Prison Site and Yuma Crossing are located within the city. Find adventure in the many parks, recreation and wilderness areas located nearby. El Centro, California: 41 miles west. Borrego Springs, California: 115 miles northwest. San Diego, California: 158 miles west. Gila Bend, Arizona: 114 miles east. Phoenix, Arizona: 179 miles east. Tucson, Arizona: 237 miles east. Yuma Prison Site Historical Park: Yuma. Yuma Crossing State Historical Park: Yuma. Organ Pipe Cactus National Moment: 169 miles southeast. Anza-Borrego Desert State Park: 100 miles northwest. Kofa National Wildlife Refuge: 30 miles north. Imperial National Wildlife Refuge: 40 miles north. Cabeza Prieta National Wildlife Refuge: 60 miles southeast. Muggins Mountains Wilderness: 25 miles east. Trigo Mount. Wilderness: 25 miles east. Salton Sea Wildlife Refuge: 65 miles wet. Imperial Sand Dunes: 20 miles west. Sahati Desert Animal Breeding Center (Yuma): 928-627-2553.